Every hand builds a dream. Every home creates a future. People in your community and all over the world partner with Habitat for Humanity to build or improve a place they can call home. Habitat homeowners help build their own homes alongside volunteers and pay an affordable mortgage. With your help, Habitat homeowners acheive the strength, stability and independence they need to build a better life for themselves and their families. Your financial support, your voice, and your time will help families in need of a decent place to live. Meet Toni and her boys. 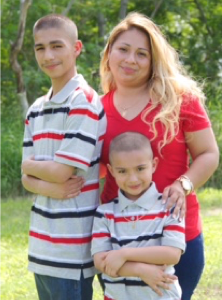 Toni and her two boys were living in an unhealthy environment with mold issues in every room. The landlord continued to just paint over the areas never eradicating the real problem. There are no recent events to show at this time.